mind – your thoughts or your ability to think, feel, and imagine things mental. self – the type of person you are, your character, your typical behaviour etc. soul – the part of a person that is not physical, and that contains their character, thoughts, and feelings. Many people believe that a person’s soul continues to exist after they have died. Often the mind, self and soul are synonymous, but as the definitions show they are not used in the same way. There are no true or perfect synonyms. While the definition of the mind does not mention character, the definition of self does not mention thoughts. The former is about ability; the latter about quality. In the definition of the soul both ability and quality are brought together. It also contains or emphasises two further qualities – that of non-physical and (sometimes the belief in) its continuation beyond physical death. I doubt anyone thinks that thoughts and feeling continues to exist in the mind after his or her death, or that one can be described as being a type of person with a certain character or behaviour after his or her death. It is with the soul only that we continue to think of someone’s continued existence beyond their physical one. But what is this ‘part of the person that is not physical’ that no one has seen and everyone infers to exist? By what evidence does one have to make this inference? I can infer thought from physical reaction, and character from physical attributes. But one cannot infer the existence of a soul from death, apart from the cessation of thought, feeling and characteristics. What can only be inferred is that death is the cessation of these. Souls, then, are the thoughts and remembrances of the characteristics of those who are living, or have since passed. This entry was posted in other and tagged mind, philosophy, self, soul, spirit on 3 December 2018 by signature103. In psychology there is differentiation between sensation and perception. Sensation is the reception of signal alone. Nothing about this signal is analysed. Perception is the stimuli analysed within the brain to make sense of it. So Buddhism makes sense to call the mind (or brain) the sixth organ that brings together all the information into a coherent whole. To not distinguish an organ as Western thinking has done has been a disservice to their understanding. The reasoning behind this is partly due to the belief in the soul and by extension the mind. Western science and philosophy has had a tough time reconciling the mind in relation to everything else. For Buddhism there is no mystery to the mind. It has no higher place separate from the rest of physiology. It is as much part of and impermanent as everything else. This entry was posted in buddhism and tagged cognition, cognitive science, mind, soul on 13 February 2017 by signature103. 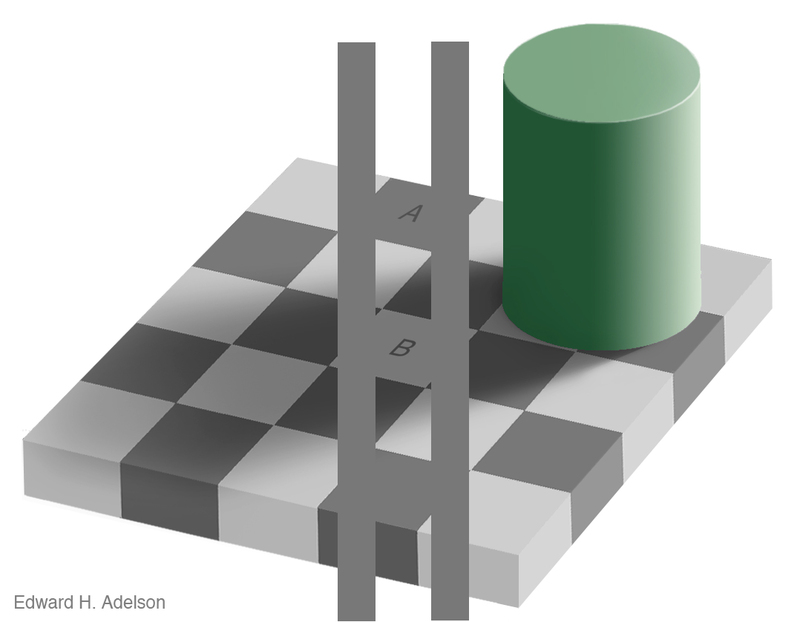 Clearly, you see that the checker squares labelled A and B are of different shades, right? But check by isolating the squares from the surrounding and you will see that they are in fact the same shade of grey. What is going on here? From experience you have learned that shadows change the shade of colours they fall upon, and that your mind will compensate for this. Note that it is not your eyes that is “doing” the compensating here, but your mind. Your eyes received the colours and shades as they are, and it is your mind that is doing the adjusting. Remove the surrounding information and you mind will no longer compensate allowing to see the shades as they are. In Western understanding the mind is not considered a sense faculty. Traditionally there were only thought to be five senses – sight, sound, smell, taste and touch. And the sense corresponding organs were the eyes, ears, nose, tongue and skin. The mind was seen as something different, therefore the brain was not seen as a sense organ. In Buddhism, the mental objects are sensed by the mind, thus the brain is counted as the sixth sense organ. This has two important implications. Firstly, mental objects (thoughts) are placed on par with the objects of colour and form, sound, scent, flavour and texture, and makes the contents of thought as something ordinary. Secondly, it removes the mind as the seat of some kind of self by default of the ordinariness of what happens in the mind. In this way we are able to deal with our thoughts and not be ruled by them. Essentially this is what the Buddha’s teaching is all about – taking control of yourself as a physical being – by showing us that the thoughts are really just the real world things that we can control. Perhaps the self is an illusion as well, much like this image. This entry was posted in buddhism and tagged mind, optical illusion, self on 16 September 2016 by signature103. Is The Buddha a god? The Buddha was born a prince. His mother died soon after giving birth to him. So there is no claim of divinity of any kind. He was an ordinary man with ordinary problems just like you and me. And therefore he is not a god. Nor should he be worshipped as such. Buddhist iconography was something which arose after his death. And temples are not places of worship. Both of these are created to help us understand his teaching, the dharma, which is we alone can liberate ourselves from unhappiness through attention to the nature of one’s body and mind. This then means that Buddhism is not about faith but practice. The practice espoused was to look after the mind as much as we look after our body. This Buddhists do through meditation. Meditation does not have any special powers as such but only allows one to focus the mind to see clearly what the mind and body are. Some kind of basic understanding is necessary of course, but essentially it is that everything is impermanent, without self and suffering. Nothing including Buddhism lasts forever. That includes the self which many people cling on to. The self is an illusion. And that is perhaps the greatest of all roots of our suffering. Understand that this is what existence is then we can proceed to find the happiness which does not diminish. This entry was posted in buddhism and tagged buddha, enlightenment, happiness, impermanence, meditation, mind, no-self, practice, religion, satori, self, suffering, zazen on 20 October 2013 by signature103. Did you know that 40% of world’s civil or internal wars in the last half century have been fought over for natural resources? Today is International Day for Preventing the Exploitation of the Environment in War and Armed Conflict. We should remember the (illogical) reasons why we are fighting in the first place. Then, may be, we will put down our weapons and make peace instead. This entry was posted in buddhism, sustainability and tagged culture, environment, exploitation, mind, peace, prevention, psychology, society, un, united nations, war on 6 November 2011 by signature103.